One of the hardest things I have ever done in my life is be a parent but it's also the thing I am proudest of. Most know I started this job as a Mama at the young age of 16 years old... I brought into this world (yes I, the father chose not to be involved) a beautiful, smart and amazing baby girl. Her eyes lit up my world, her hair drove me insane and my life totally changed for the better. I went on to have two more amazing girls and two awesome boys completing my little group of five, yes five, children. Starting at 16 and having five children by the age of 23 was insane. No birth control worked. Period. Pills, shots, you name it, nothing... thankfully as I was gifted with these AMAZING children. So during my pregnancy for my fifth I made the decision to make a more permanent choice after finding a doctor that would allow me to do so. The rules in Virginia to have a tubal ligation are completely insane and it was not easy but I was able to find one, so the day after my youngest child was born they rolled me into surgery and it became me and my five babies. Yes when my youngest 4 were little their father was very much in their life physically, not financially, and we were together a good amount of the years of their youth. I left him when my youngest was about 4 years old. I won't go into a lot of the reasoning why here right now but there were plenty of reasons and it was at the breaking point. When you are essentially raising kids by yourself and being hurt emotionally repeatedly that tends to happen. So at the age of 26 with five children in tow I became a true single mother. Yes I dated, even lived with a man for two years before coming home to an empty place one day (that's a whole other story...) and yet still I pushed on. NOTHING has been perfect. I've made mistakes and of course there are things I wish I could do different. I'm positive if you ask my kids how happy they are with their mom they could tell you quite a few things they aren't happy about but they are young adults and teenagers so that's pretty common I believe.. at least I hope so. My wish is when they become parents, when they see what their life could have became, when they get older they are really able to see the sacrifices I made, the hard work I put in and the difference I really did make in their lives. My oldest daughter is in college for early childhood education and turns 21 this month, my 19 year old son is station in Ft. Drum, NY with the United States Army and is marrying his middle school sweetheart next summer, my 18 year old daughter finds out this week hopefully when she will be leaving for basic training with the Army and I have 2 more in school that are 14 and 15 that my husband and I want to take and travel around with in the coming months, showing them a life they never could have known. Over the years I have been blessed with family, friends and more who have been the community my children needed in growth. They've had mentors, godparents and more always looking out for them. I also now have an amazing husband in my life who has told my children from day one he will never try to replace their father but will love them and be there for them as he has been. He has helped us so much in the last two years and we balance each other out so well. 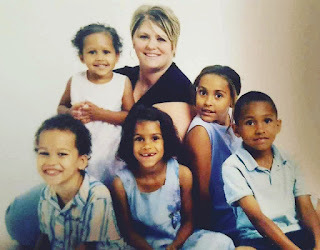 Yes I have made mistakes and there is a whole lot more to my story than this but I am a teenage mother, who kept her babies, who has worked really hard and my biggest goal is to make sure they have a better future than me and I hope they make sure their babies have a better future than them. I hope to inspire a young struggling parent out there as I know that hurt... Keep working, it'll all be okay and yes I plan to tell more of my story, especially to those out there who need to hear it. I may not be where I want to be but I know how far I have come!